Save people from fires—but don't burn to death—in this board game adaptation. Flash Point: Fire Rescue is a fantastic co-op board game that just made its way onto Steam. Think about a tactical maneuvering game like XCOM, but with firefighters, who are probably braver than alien hunters anyways. In any given scenario your team's job is to save people from a burning building—not put out fires. You're the people who go inside. The PC game is built a lot like the board game, with local co-op being a major feature. Each player takes on a specific role, like Paramedic or Driver, that has unique abilities or advantages—then you get to the hard business of saving lives. The digital adaptation includes both the Family ruleset, which I find fast and fun, and the sometimes painfully difficult Experienced rules, which include such real-life firefighting joys as flashover. The original game, published by Indie Boards & Cards, is beloved in the board game community for providing a challenge to a range of ability levels and its rather good expansions. Developers RetroEpic are making the digital adaptation, funded via Fig, and it's going to adapt several of original designer Kevin Lanzing’s expansions to the game as DLC—here's hoping for Tragic Events. Beyond that, RetroEpic has hinted at a rather curious idea: that it's adding an update to the game so that you can tweak and add your own House Rules, which I'm wholly on board with for tabletop adaptations. Beyond that, online multiplayer is forthcoming, though couch co-op is available now. 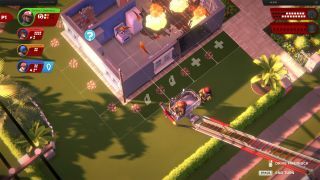 Flash Point: Fire Rescue is out now on Steam. Personally, I won’t be buying it until they add the rescue dog expansion.